Didy Investments Ltd T/a EmbroidMe is committed to protecting the privacy and security of your personal information. This privacy notice describes how we collect, use and store personal information about you during and after your business relationship with us, in accordance with the General Data Protection Regulation (EU 2016/679) (GDPR). Didy Investments Ltd T/a EmbroidMe is a "data controller". This means that we are responsible for deciding how we hold and use and store personal information about you. We are required under the GDPR to notify you of the information contained in this privacy notice. WHAT INFORMATION WE COLLECT FROM YOU ? Personal data, or personal information, means any information about an individual from which that person can be identified, whether directly or indirectly. It does not include data where the identity has been removed (anonymous data).There are also "special categories" of sensitive personal data which require a higher level of protection. Personal contact details such as name, title, address, telephone number, email addresses and IP address. Where we need to perform the contract, we have entered into with you either on the website or instore. Where we need to administer your account with us. Improving services and products provided and or, supplied by us. Making arrangements for the termination of our contracting relationship. Dealing with legal disputes involving you, or any disputes that may arise under the contract that we have with you or the way in which we provide our products and services to you. If you fail to provide certain personal information when requested by us, we may not be able to perform the contract we have entered into with you (such as providing you with our product or services), or we may be prevented from complying with our legal obligations (such as financial and tax reporting and insurance maintenance). You have a choice about whether or not you wish to receive information from us. If you do not want to receive direct marketing communications from us about the work we do and our exciting products and services, then you can select your choices by ticking the relevant boxes situated [on the form on which we collect your information]. Where we need to carry out our legal obligations and in line with our Data Protection policy. Where it is needed in the public interest, and in line with our Data Protection policy. We will share your personal information with other entities in our group [as part of our regular reporting activities on Didy Investments Ltd T/a EmbroidMe performance, in the context of a business reorganisation or group restructuring exercise, for system maintenance support and hosting of data . In some circumstances we may anonymise your personal information so that it can no longer be associated with you, in which case we may use such information without further notice to you. Once you are no longer a customer of the Didy Investments Ltd T/a EmbroidMe we will retain and securely destroy your personal information in accordance with our data retention policy or current applicable laws and regulations. 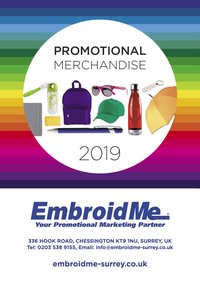 If you have any questions about this privacy notice or how we handle your personal information, please write to us by email to info@embroidme-surrey.co.uk or by post to Didy Investments Ltd, 336 Hook Road, Chessington, Surrey KT9 1NU.